Join the DIY craze! You can help families achieve affordable housing by partnering with Habitat for Humanity - East Polk County. Work side by side with family members and other volunteers to make these local families' dreams a reality. No construction experience required - there is something for every skill level. This is also a great way to learn new skills. 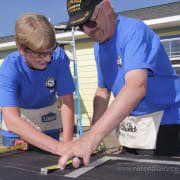 Here are some examples of volunteer tasks: framing, installing insulation, priming, painting, installing soffits, installing vinyl siding and windows, caulking, etc. Days and times vary for each project.